Yeah. It's laying "flat" in this picture. CRAP CRAP DOUBLE CRAP! Stupid me forgot that I'd be sewing with a lot of bias edges! Grrr. Now, I'm worried about my ability to make one that does lay flat! I *think* that using pins and laying the quilt-in-progress flat before I pin the next piece will solve the problem, but I'm having some major self doubt here. If anyone has any great tips for this bias-challenged quilter (Tracey, this means you!) please tell me! In more happy sewing news, I finished my June bee block for VIB's. Meghan is making a patriotic quilt for her hubby who is in the Army. I chose to do a paper pieced spinning stripes block. The instructions said it finished at 12", but in reality, it finished at only 10"! I guess I could have figured that out if I took a ruler to the pattern! Since Meghan wanted the blocks to finish at 16", I knew I was going to have to add borders anyway, so the smaller size wasn't a big deal. 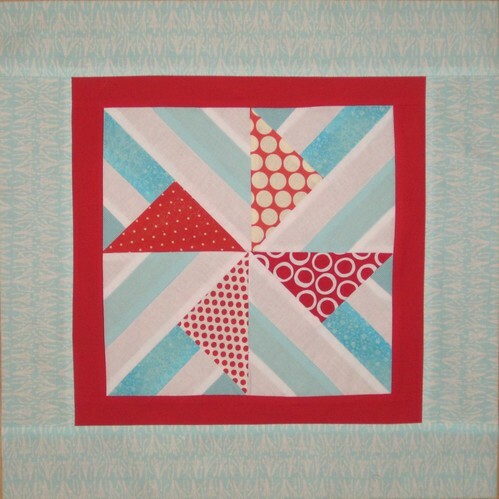 I've also joined Jeni's QAL, Warm vs. Cool. 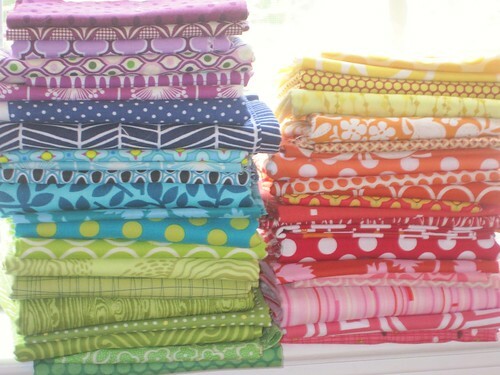 These are my fabric picks. I did end up taking out some of the green, adding some yellow and blue. I'm half way through cutting out the squares to make HSTs, but this project will have to be put on hold for a bit since I'm going out of town tomorrow for a week. We're going to my in-laws in Missouri. Though I'm sad to be away from my machine for a whole week, I get to meet my nephew (Ezra Stegosaurs) for the first time! Plus, my MIL is super sweet and waits on us hand and foot! Do you also iron the front each time you press a seam? I was just introduced to this technique in a VQB, and it seems to help getting the fabric flat. Or at the very least, you'll identify any problems more quickly, since you'll be looking at the right side of the fabric! LOVE the spinning stripes block! :) Is the pattern available anywhere, or do I need to recreate? oh, wow - yeah, you weren't kidding. ;) That's a lot, isn't it? yikes! i've made mistakes, but it's never been for a tutorial, so it doesn't matter that much, you know? hope you figure it out soon! and yay for ezra steg! I'm no help on the bias edges. Sorry! I've been drooling over your warm/cool stack. I'm really close to caving and joining that qal! Not sure how to handle the bias edges as you're quilting, but when you are doing garments - you end up 'staystitching' the edges inside the seam allowance. You basically start at the middle of each individual piece and sew a straight stitch just inside the seam allowance to the end, repeat going the other way. Helps keep things from stretching too much as you're putting things together, but I think this would be extremely time consuming on a quilt. Again, I speak only in theories. ((Hugs)) to you and the boys! I have never had good results sewing with long JR strips. It seems like no matter what I do, they stretch like crazy. I am not sure if it's something I am doing, or if they way they stretch the fabric into the roll that is causing the issues. It doesn't look like you are dealing with enough bias to really make that big of a difference. I have had similar issues with the circle table toppers I make, and that's usually because I didn't keep my seam allowance consistent. Sorry, friend. It looks like you may have some un-sewing in your future!